Now that Vortapt IV is finally closing in I thought it would be a good idea to prepare my list for it and show how I go about it. 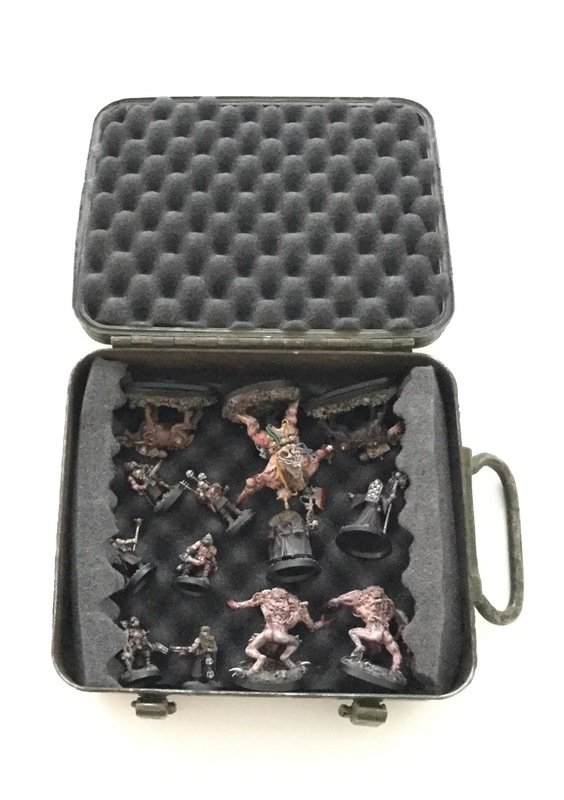 Now we won`t do the AoS way of “bring what you have to the game”. It will be a bit more structured than that. So here`s how that will be regulated in the Vortapt IV campaign. The warband roster is already prepared as I showed yesterday with the AoM version 1.3 upload. It has space for points and rewards that my warband will hopefully reap in the games. One addition is the starting wounds overview. Just to keep track of things. So what to collect right! Because as you can see now is that I have way more models than I actually need for my starting gang. I`ll start with the easiest task and that`s my champion. He`s not overpowered, he`s not the biggest but he does pack a nice punch with his Butcher`s Axe. A very nice and fluffy aspect of him is that he gets patron points for killing other champions. Fitting imo! But what to accompany him with that`s the real question. I won`t be able to get my tanks ready in time so nothing big here meaning all gangers. This leaves me with the “luxury” of taking a second champion model as he gives me some nice buffs. Note his little rule of turning peeps into Blood Wolves. May not be the most tactical clever move but it’ll be fun! Since I don`t have any tanks, I still need some muscle so I’m adding the Alfa..
..and my hunting dogs. I kinda have a hunch that their flexibility will be a bonus for me as my Blood Pact are frightingly normal compared to the other warbands. So far I`ve taken a sizeable chunk of my wound quota but I hope it will pay off. Note that my high energy weapon is used here as one of the hounds has one mounted in its mouth. Okay so 3 left. That leaves 2 for close combat. And one for ranged combat primarily. A good mix and I actually have most of my guys in play 🙂 As you can see I`m not really using any particular weapons. Don`t even have a heavy weapon weapon with me! That`s why it`s a bit sad that I can`t bring a tank to the game but I just don`t have the time to get it ready. This leaves openings for part 2 of Vortapt though. What I do need though is a stylish box for transport. So luck has it I have a few old army storage boxes. 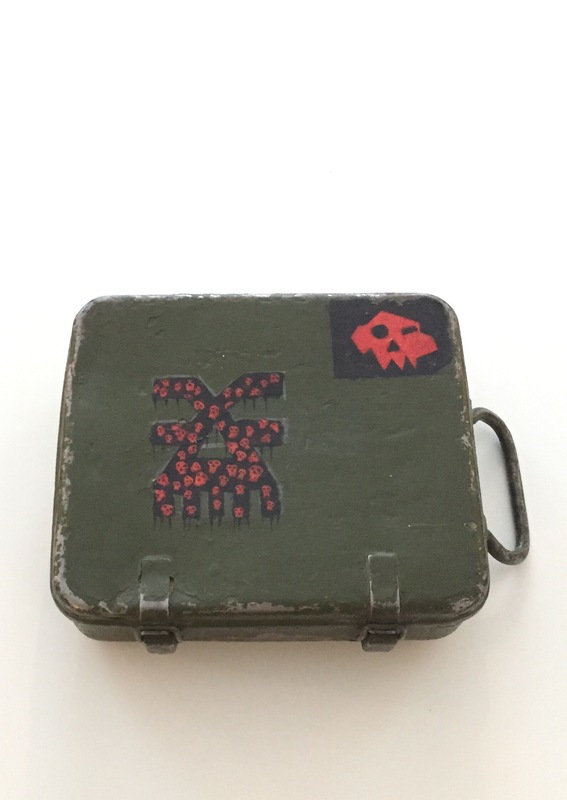 I took one of them, painted some crappy freehand on it to mark what’s in it and that it’s mine and cut some foam to fit in there to protect them. Cool beans! Very nice mate – kudos for keeping if fluffy! Thanks for showing the rules for your warband! They look really characterful and fun. Your force is general is spectacular (love the carrying case too, the military aspect of it fits well). Never have I seen a Khorne themed guard force so perfectly embodied. They have the crazed and addled look while still retaining a trained and dare I say professional vibe. I particularity love your standard Blood Pact soldiers. The use of Death Korp Grenadiers was inspired. The inclusion of the sniper is appreciated too (great name too! He he); surely the Blood God can appreciate a good sniper. Thanks to you we found the best ruleset for our games ideas! soon we are running a campaign here in Argentina 🙂 Tor Meggido and Vortapt are serious inspiration!! 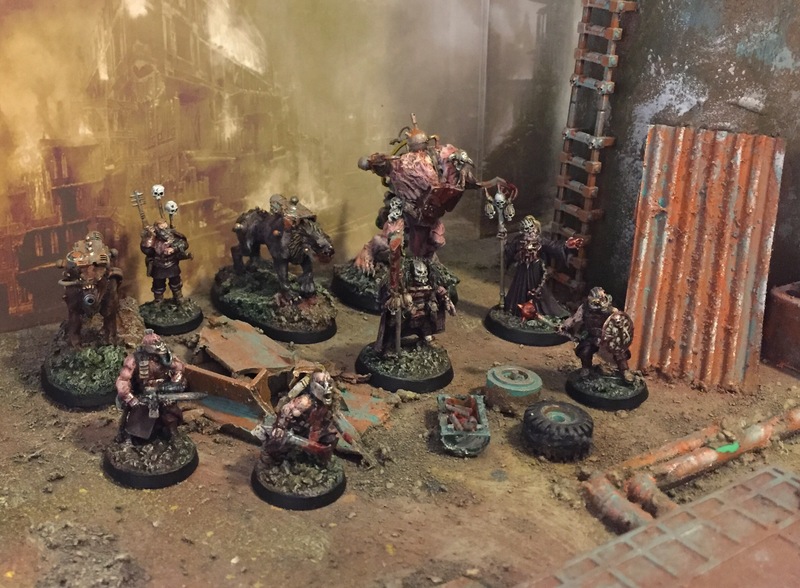 I have a question, where do you get the special rules for each model? from the AoS rulebook or i can use some of the Wh40k rulebook? or make my own rules? The special rules I just make up based on how I want my characters to work in a game. The key is making it characterfull not overpowered. Thanks pal! Good! So another question is about the tank, that is a rule for your warband only, right?